I’ve been trying to fit as many beautiful summer vegetables into each dish as possible (this one hits the mark) This makes for a light, delicious, vegan summer dinner. Cook the potatoes ahead of time when the cool morning air allows it, warm before serving. Heat olive oil in frying pan over medium heat. Once the oil is hot, about 4 minutes, add carrots and stir occasionally for 5 minutes. Add garlic, onion, mushrooms, tomato, zucchini, and beans. Continue to cook for about 10 minutes. 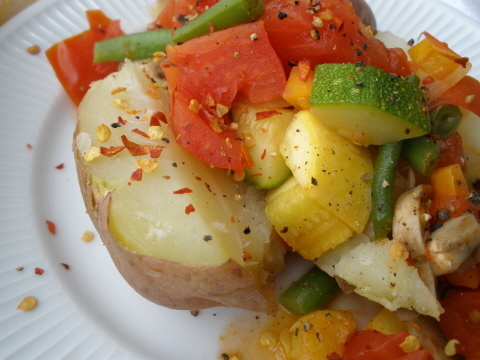 Split potato down the middle, and top with veggies. Garnish with red pepper flakes and fresh ground pepper (optional).